For better, for worse, Columbia City is changing. 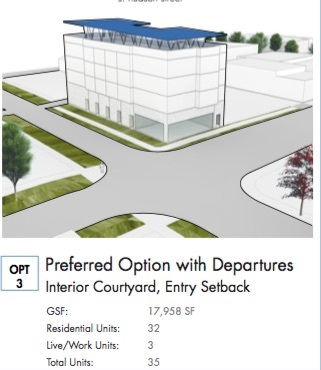 One of the largest changes on the horizon is the proposal for a new mixed-use, 7 story, 241 unit, 25,000sf of retail project planned for the current site of the Columbia City Post office (no word on what this means for a future CC post office location). The site has some unique (and steep) topography, wrapping around the Burdick Security building and stretching all the way to the corner of 38th and Alaska at the Genesee ballfields and up to Rainier directly across from the library. Today, the planners posted a new design review packet which helps give a sense of the scale, style, and potentially huge impact of this proposal. 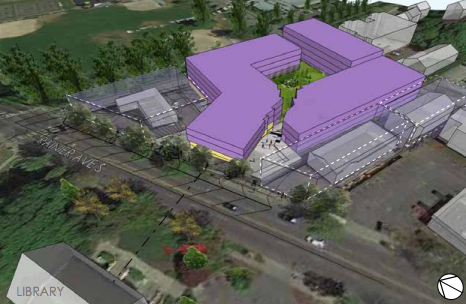 As you can see, this is a big one and will drastically change the feel and offerings of Columbia City. There’s room for an impressive amount of retail (including some large-scale retailers and a mix of smaller shops, restaurants), improved pedestrian access to Genesee and the park/community center, and another 250 apartments + 245 parking spots (86 retail, 159 residential). Of course, there are pros and cons to all of that. 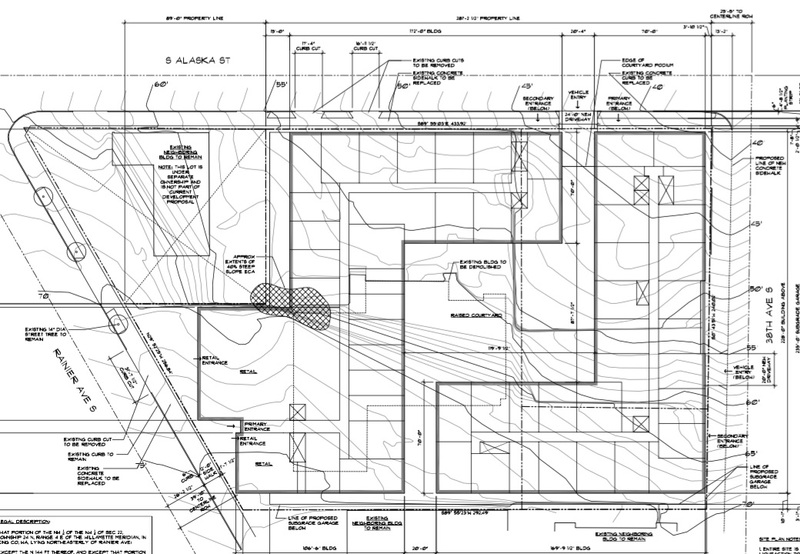 There’s not a ton of info out there, but new permits indicate that the empty space next to Rookies (3810 S Ferdinand and the former Jones BBQ spot) will soon be home to a new Columbia City Veterinary clinic. If there’s more info out there about the clinic, be sure to chime in. 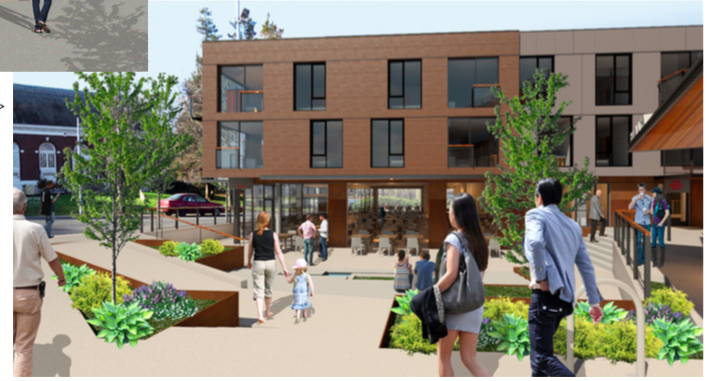 On Tuesday afternoon the Columbia City [Historic District] Review Committee met to review the alterations planned for the Hastings Building at 4901 Rainier Ave S. The north portion of the building (including the corner) will have a Pagliacci Pizza shop where Carol Cobb salon used to be. The building was damaged on August 28, 2014 by a car running into it. The biggest change seems to be that the existing canopy will be removed and new steel and glass canopies will be installed. The Columbia City Facebook page has been blowing up lately with reports of new condos, apartments, and mixed-use spaces planned for the neighborhood. Thanks to Scott A. 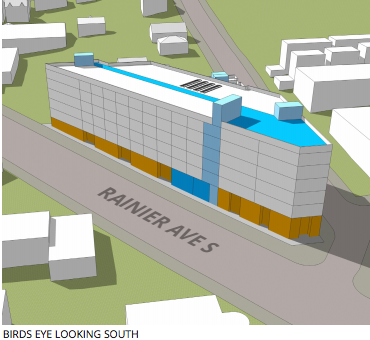 (the neighbor behind a lot of these posts), Columbia City Source has a well-maintained development map that allows readers to get a birds-eye view of what’s potentially coming to our pocket of Rainier Valley. Click here to check it out. 37th and Hudson: Located across from the Greenhouse Apartments, next to the Super Six parking lot. 4-Story. 35 Units. Microhousing with limited live/work and possible retail. No parking. Columbia City Post Office: This could be a major change to the neighborhood. The proposal is for 240 units (that’s on the scale of the PCC/Angeline project) and would replace the current post office building with a 7-story project that spreads from the post office location all the way up to Rainier. There’s been lots of concern about the future of the post office. Here’s one reply from the city that a neighbor received. 39th and Ferdinand Church Conversion:This project has been in the works for years, stalling out a number of times. Recent permits and proposals suggest that it’s back on. The plan is to convert the existing, empty church building into apartments and condos (looks like eight units) and to demolish a portion of the structure for single family homes. 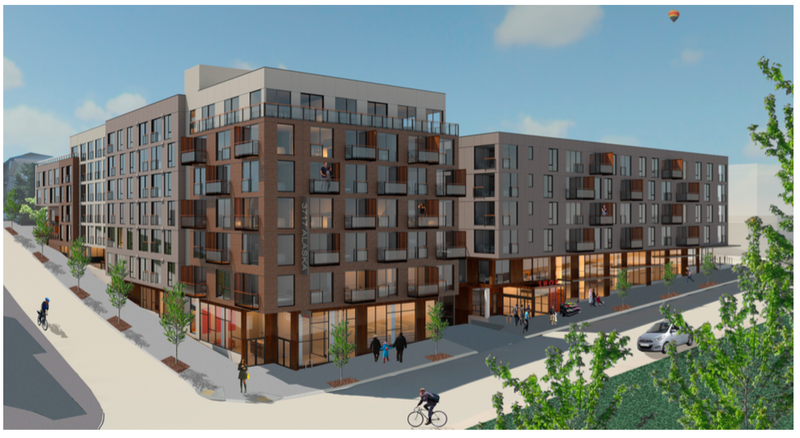 Alaska and MLK: 200+ units and retail planned to fill the empty lot directly adjacent to the light rail station. 39th and Rainier: 120+ Units between Columbia City and Hillman City. Includes retail. Currently the home of an auto lot. The Rainier/MLK Bowtie: A bit of a different kind of proposal and a bit north of Columbia City, but important to be aware of. The pic below is the proposed redesign for the complicated intersection near Franklin High School and the Mount Baker Light Rail Station. Here’s the Seattle Bike Blog’s review of the plan. In addition, be sure to keep an eye on the LEM’s bookstore/Busy Bee area (just south of Columbia City’s main business district). The whole block is essentially for sale–some rumors are trickling up that there are deals in the works. We remember when Tutta Bella pizzeria opened in (gulp) Columbia City. A Starbucks too. Pioneering businesses, taking a risk. That was about 15 years ago. Flash to now: the diverse neighborhood in southeast Seattle is fully and officially popping. Especially the retail around Rainier Avenue! So this means it’s time for us to talk about the G-word: gentrification. What’s next? Two words: Hillman City. That’s the still-depressed commercial strip immediately south of Columbia City’s commercial strip. Its younger and anemic sibling. As Columbia City keeps gentrifying — and yes, there’s a lot more to come — so will Hillman City as it catches the spillover. Gentrification, as we all know, is a loaded word. It takes on different meanings and evokes different emotions depending on which lens we use to view it. Rents in The Angeline range from $1,600 to $3,400 per month. If you own property in Columbia City, the upward movement likely brings joy, or at least relief. Homes that sold three years ago in Columbia City for $350,000 now fetch $450,000 to $500,000. If you’re low-income, even lower-middle-income, the same upward movement likely brings sadness, pain and anger at seeing your eventual displacement. Why and when did you start your first bookstore? 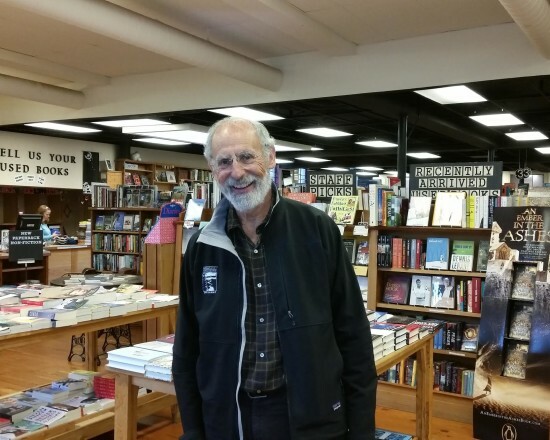 It’s been about 15 years now since Third Place Books in Lake Forest Park opened. It is the first bookstore I’ve owned, although I’ve had several as tenants. I felt that locating a new and used bookstore, a coffee shop, and the restaurants and cafes along with other services and amenities would attract customers and enrich a community. I figured if I could bring all these elements together and open simultaneously, it would greatly improve the store’s chance of success. Why the new/used books model of bookstore? I like to see books passed on. It’s recycling, and it makes books more affordable. And I think it makes a bookstore even more interesting. Any more Third Place Books in the works? We are planning to open a new Third Place Books along with a restaurant at the site of the Seward Park PCC. They’re moving to Columbia City in July, and we hope to open in November. Clair Enlow has the a new piece entitled “Design Perspectives: Angeline Apartments will Feed Columbia City” in the Daily Journal of Commerce. Click here to read the whole piece. Photo by Clair Enlow. DJC. Columbia City has a long history, but it has waited a long time for Angeline. Now a big package of sorely needed urban goods is being delivered, on a very tough site. 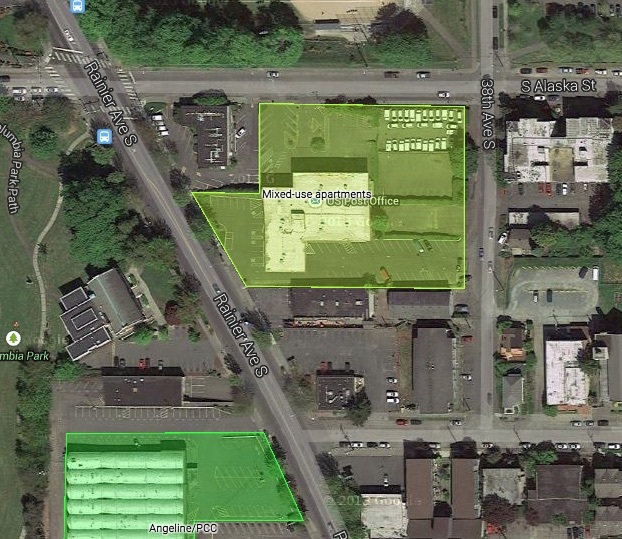 Security Properties is developing the mixed-use building between South Angeline and Edmunds Streets, just off Rainier Avenue South. 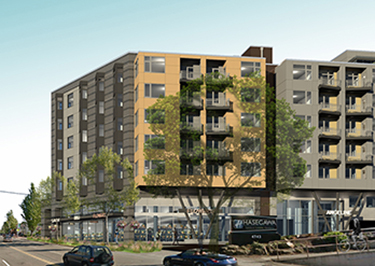 It’s anchored by a PCC Natural Markets grocery store with 193 apartments above. …Security Properties purchased the site in 2011 from HAL Real Estate Investments, which had bought it in 2007. After lengthy reviews with community input, the landmarks board had rejected design proposals from HAL showing a 306-unit apartment complex wrapped around an interior court. The board was more receptive to Security Properties’ proposal, which made the building very approachable from three sides. The Angeline project was designed by Bumgardner, which also designed PCC’s first supermarket-sized store in Fremont, part of a mixed-use project there called Epicenter. At six stories, Epicenter and Angeline are each taller than their historic neighbors. But the five-floor residential part of Angeline is stepped back from the edge, and the tall walls are not parallel to the base. They shift direction, which makes for interesting views from all sides and from the many apartment balconies, and breaks up the bulk and scale. Unfortunately, the character of the outer walls seems to shift abruptly with each corner, which makes the much-reviewed building look like it was designed by committee — which, in a way, it was. Looking east along South Edmunds Street in Columbia City, this view shows that Angeline sits on a difficult site. Completion is scheduled for July. Perhaps the biggest challenge to developing the site was an existing one-story corner bank with drive-through lanes and parking. The bank carves away about a third of the Angeline block, but it now faces 20-foot-high concrete party walls on two sides. The good news is on top, where a long, broad deck above the 20-foot base of Angeline will support an urban farm similar to one that produces food for Bastille Cafe and Bar in Ballard, according to John Marasco of Security Properties, which owns the building in Ballard, too. The piece goes on to discuss some of the specifics of the location, the planning, and the overall design of the building. Click here to read the whole thing. Over the past few weeks, I’ve had a few people ask if I know anything about the major development that’s being planned for the area around the post office and Burdick’s Security, just past the NW corner of Alaska and Rainier. Neighbor-in-the-know, Scott, recently posted this site plan to Columbia City Source’s Projects and Development Map (which is always accessible by clicking the link at the top of the page). 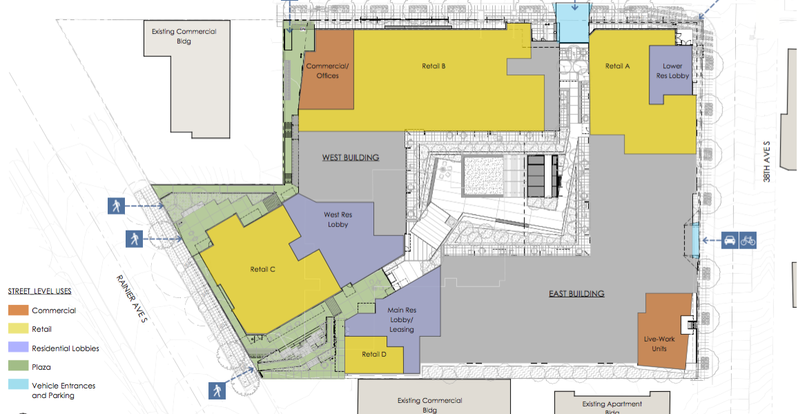 Taking a look at the initial site plan, this is a big project, with plans to demolish the post office building, keep the Burdick Security building, and build all the way up to Rainier with more retail and multiple stories. Johnston Architects submitted the proposal. Their work can be seen here. Of course, at this point, nothing is finalized…but this would definitely be another enormous change to the neighborhood. If anyone has anymore information, be sure to let us know. This was posted about a month ago on Vimeo, and I didn’t think too much about it. However, after finally watching it, I figured it was worth posting. Columbia City-based Dwell Development, the group responsible for a number of modern homes throughout the neighborhood, including these on Edmunds (starting in the mid $900s), put together a promo video for their Rainier Development project (which has a total of 51 homes). Technically an advertisement for their micro-community, it does, however, provide an overview of this major addition to the neighborhood and highlights the elements, design, and philosophy of the project. Since so many neighbors I’ve spoken with are unaware of the specifics and scale of what Dwell’s been up to at Rainier Vista, (or even the company’s presence and impact on the neighborhood at all) the video–I decided–was worth posting here. For more Columbia City-related Dwell videos and projects, click here.